Bunkers shots from a plugged lie are perceived as one of the toughest shots in golf. But they needn’t be. For the uninitiated, a plugged lie is when the ball sits half-buried in the sand. This can happen if the ball flies straight into the bunker from quite a long, high shot, or it might roll into a natural crater in the sand. Either way, we need to adjust our set up and the way we play bunker shots from a plugged lie comparative to normal sand play. 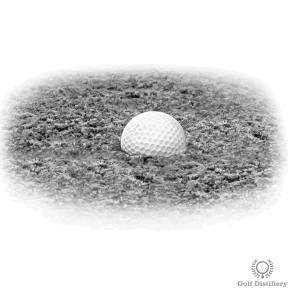 Normally, we’d aim to strike the sand 2 inches behind the ball and 4 inches after the ball. But for a plugged lie I’d like you to draw a box around the ball that is about 3 inches from the ball on all sides. The aim is to remove this entire box of sand. Use a sand wedge – the extra bounce will prevent the club from digging too much into the sand causing you to hit it too heavy. The set up is similar to a normal bunker shot – shoulder-width stance, feet dug in for balance, ball played ahead of centre in the stance (the club head will enter the sand at a point that corresponds to the dead centre of your stance). Keep the club face square (not open like with standard bunker shots). Remember to align your feet and hips only slightly left of target, shoulders square to the target. Grip down the club for control but here we want to grip really tightly (grip pressure of 9 out of 10). This will help prevent the club from twisting and decelerating quickly as goes deeply into the sand. Really emphasise the follow through so that you drive as much sand forward on to the green as possible. Remember, there will be very little spin on the golf ball and you might have to accept the ball will roll past the pin. Don’t get too cute trying to finish pin high as you need to be very aggressive to get the ball out of it’s plugged lie.